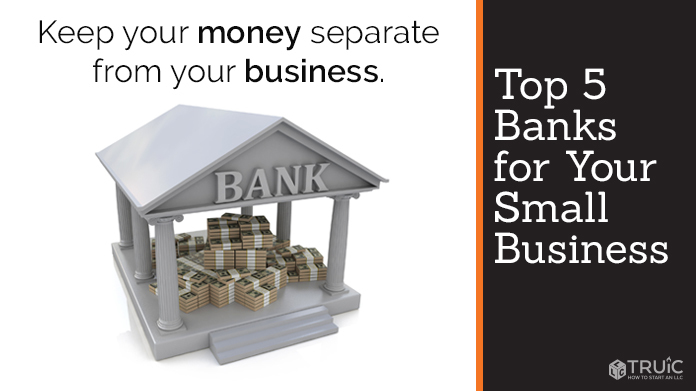 Opening a business bank account is an important step toward legitimizing your business. Business bank accounts appear more professional and help protect your personal assets. In this comparison of the top 5 business banking providers, we strip away the fluff and give you a side-by-side view of the features you should consider when opening a bank account for your business. As one of the largest banks both domestically and internationally, Chase has banking options to fit the needs of businesses of all sizes. Chase offers over 5,100 branches and 16,000 ATMs in the United States. Chase has several solutions for reducing monthly fees. A customer can choose to link their business checking account to a new savings account or they can maintain a specified minimum balance. Linking accounts also gives customers higher yielding interest rates on their business savings account. All Chase business accounts include access to easy-to-use mobile and online banking services, Chase debit cards, and Chase military banking for service members. Chase boasts high satisfaction ratings for both their customer call-center and online Secure Messaging system. Chase is an excellent choice for businesses of all sizes that want a variety of options. Check out our full review of Chase banking here. Bank of America prides itself in supporting over 3 million small businesses through its financial services. With around 4,400 branches and 16,100 ATMs in all 50 states, this bank offers plenty of options for businesses to grow. Their mobile banking app consistently receives good user reviews and our experience with Bank of America’s customer service was exceptional. In addition to their banking services, Bank of America offers a Business Advantage Rewards program to its customers. This service provides big rewards for businesses with at least $20,000 in their Bank of America accounts. Members of this program earn higher yield interest rates in their savings accounts as well as extra credit card perks. If you find their standard interest rates to be too low, signing up for Business Advantage Rewards could give your business banking an extra boost. Check out our full review of Bank of America here. In terms of global spread, Citibank is definitely a strong choice for businesses that require banking access in international locations. With over 2,000 branches and 60,000 ATMs in 19 countries, small businesses can expect a wide range of business banking options with competitive interest rates. Citibank offers four different levels of business checking accounts to serve businesses of all sizes. Unlike other banks of its size, Citibank’s rates vary by region so it’s a good idea to check with your local branch to find out your pricing options. Much like Bank of America’s Business Advantage Rewards program, Citibank offers a Preferred Banking package to its business customers. This option has a $40 waivable monthly fee and includes special rates on business money market accounts as well as bonus offers for CitiBusiness credit cards. That being said, it doesn’t offer quite as much as the Business Advantage Rewards program in terms of extra benefits. Another point to consider is the location of your business. Citibank only allows account openings at one of their branches, while other banks can offer online applications. However, if your business is in close proximity to a Citibank branch, their business banking options are a solid choice. Check out our full review of Citibank here. With nearly 6,000 branches and 13,000 ATMs across the nation, Wells Fargo dominates the competition in terms of size. It’s not just their reach that makes them a solid choice-- their large selection of loans and banking products make it easy for small businesses to grow while developing a lasting relationship with Wells Fargo. Wells Fargo offers four different levels of business checking accounts ranging from simple packages to complex accounts for large businesses. Additionally, their monthly fees are easy to waive and their minimum balance requirements are low — even for premium accounts. While Wells Fargo doesn’t offer a specific rewards program, they offer features such as zero liability protection, mobile and online banking, and low foreign transaction fees. High-level accounts receive Treasury Management Services and access to payroll and finance management products. For smaller businesses, having these extra features may be a make-or-break decision when choosing a bank. It’s important to note that Wells Fargo has had past issues with consumer trust-- the bank misused their customers’ data in the past and has struggled with fee transparency. Although they have made strides to fix these problems, some businesses are still wary of Wells Fargo’s integrity. Even so, Wells Fargo is a viable option for businesses that need a bank with a wide reach and flexible financing options. While smaller than big banks like Chase and Wells Fargo, U.S. Bank still has a wide reach across the nation. They have 3,000 branches and 4,500 ATMs in 25 states, concentrated mostly in the Midwest region. What makes U.S. Bank stand out from its competitors is their Silver Business Checking package which requires no monthly fees or minimum balance requirements. Another strong point for U.S. Bank is their mobile banking system. With the mobile app, customers can deposit checks, send money nationwide, and request payments for free. U.S. Bank also offers direct payroll services provided by ADP, a discount on the first check order, and an unsecured credit line for overdraft protection. U.S. Bank does not provide any unique perks to its customers. There are no rewards programs and the amount of hidden fees can become confusing. While U.S. Bank offers an introductory bonus rate for their checking accounts, the majority of the benefits are concentrated in the higher-level packages. Customer service was also an issue. We found it hard to reach customer service via both email and phone. With that said, U.S. Bank still does provide a no-frills banking experience for businesses that require a basic package. Check out our full review of U.S. Bank here.